Please note that the February 23 gathering of Surrey Muse, scheduled for tonight, has been cancelled due to hazardous weather conditions. We’ll make alternate arrangements to have our featured Author Lydia Kwa, featured Poet Raul Gatica, featured Performer Sherry Duggal, Booksigning Author Ashok Bhargava, and Open Mic Opener Mariam Zohra to present in the near future. Gratitude to Raghavendra Rao K.V. for the Featured Art on this month’s poster. This is our first cancellation since Surrey Muse began in 2011. Featured art by Raghavendra Rao K.V. Surrey Muse program is put together twice a year, in Nov/Dec for January-June session and in May/June for July-November session. Dates are blind-picked by participants through an invitation. Participants are invited from a recommendations list that stays open throughout the year. Sherry Duggal is an actor, playwright, writer and poet. She has written and performed her work in India, UK and Canada. She played the lead in a comedy-mystery feature film Plus in 2012, and she has worked on a number of short films and music videos since then. Her scripts and plays have featured in international festivals including Rabindranath Tagore Festival, Sufi Legacy Conference, Diwalifest, Summer in the City, Mother Tongue Festival, Masala Mehndi Masti!, and Pull Festival. She presented her play ‘Eve: A Balancing Act’ in New Delhi and at the Edinburgh Fringe Festival. Sherry has been featured as a writer/presenter at World Poetry, Poetic Justice, Pandora’s Collective, Holy Wow poets, Writers International Network, Surrey Muse; and she has taken part in spoken word events throughout Vancouver. Sherry published her first book Beneath The Surface (Leadstart Publishing, India) in 2016, and she is looking forward to the release of her second book soon. Don’t see your link above? If you have featured at Surrey Muse but don't see your link in our 'Featured' links above, send us an email with your name and link at 'surrey.muse@gmail.com' for rapid response. 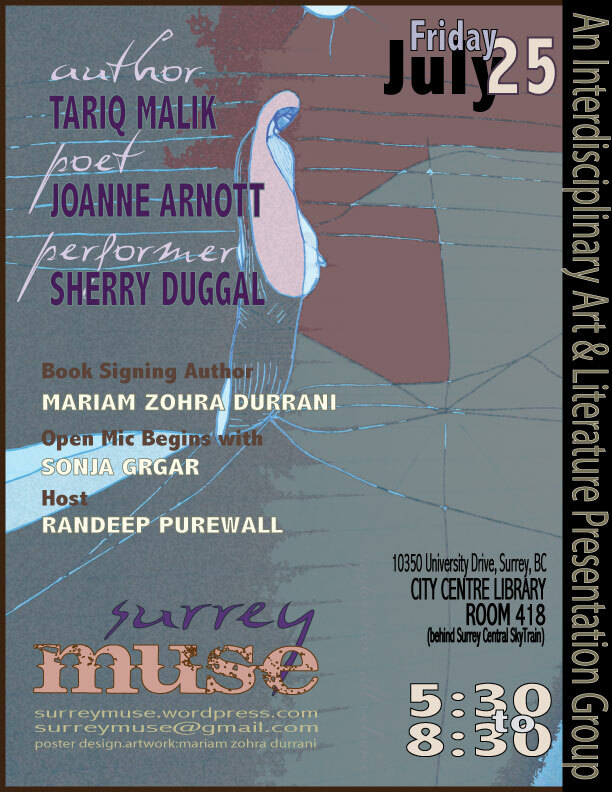 If you are a feature who is also part of Surrey Muse volunteers, find your link below. 'It was a wonderful evening: at least two more lonesome Surrey writers have found a new home, and a few more of us outlanders a place to return to. I really appreciate the careful structure of the event, alternating the visiting time with times of performance, so that all needs are met with decorum-- all performers have an attentive audience, everyone can eat and speak and connect, and community develops almost effortlessly. The blog and the truly awesome posters a part of the whole-- really well organized and top-notch! My thanks for all the forethought and talent that went into the planning, as well as the way it all came together last night-- thank you to our mc for keeping us rolling along. Surrey Muse has something very special going on! Writing at Surrey Muse Blog by Author/Creator is licensed under a Creative Commons Attribution-NonCommercial-NoDerivs 3.0 Unported License. Based on a work at As published with each item.